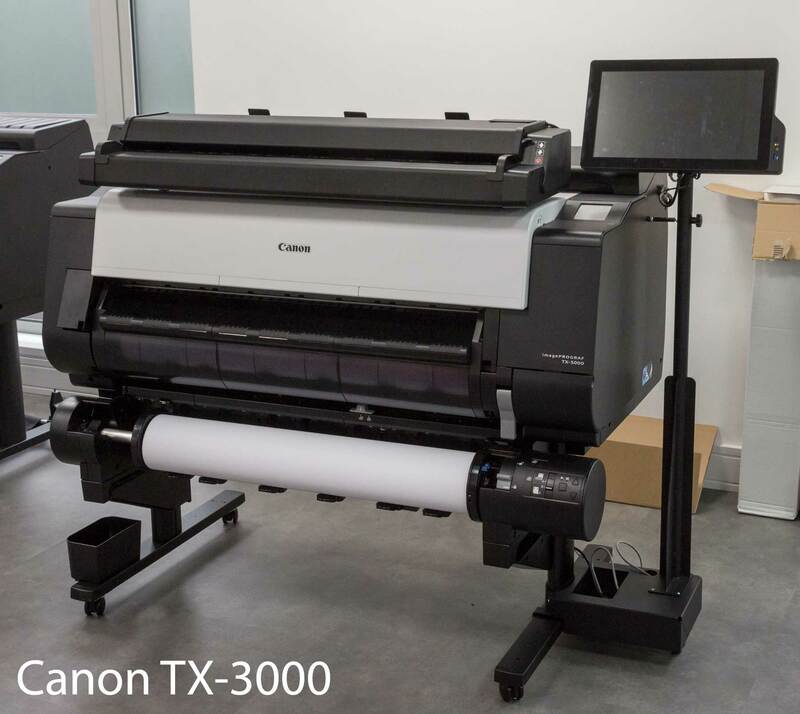 Keith Cooper has been looking at Canon’s TX-3000 printer on a visit to their Birmingham printer showroom. 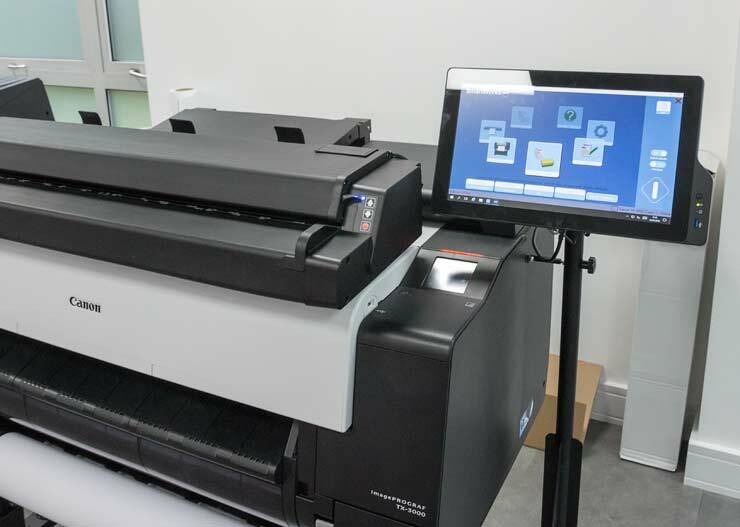 The 36″ width printer is also available as the 24″ TX-2000 and 44″ TX-4000 models. 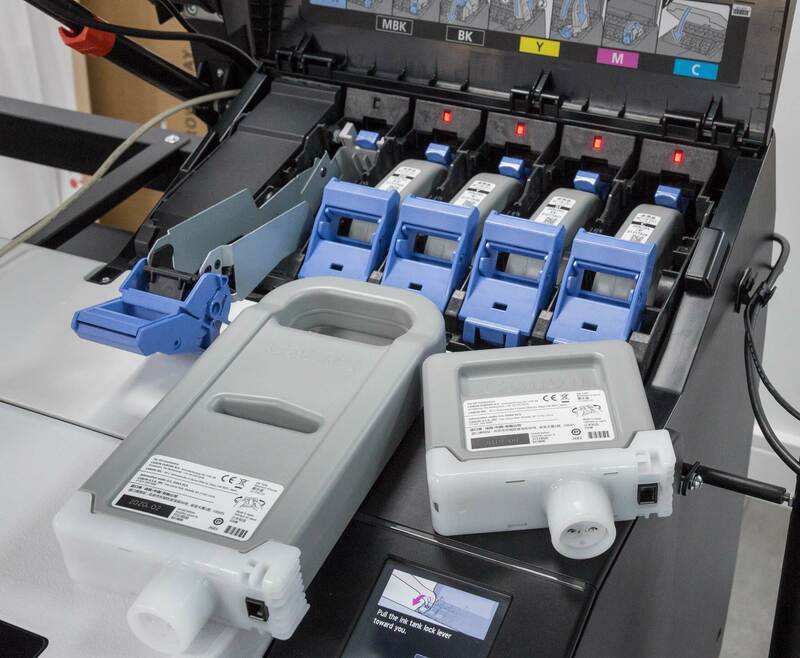 It’s a fast 4 colour (5 ink) inkjet printer primarily aimed at the CAD, plans and poster printing markets. 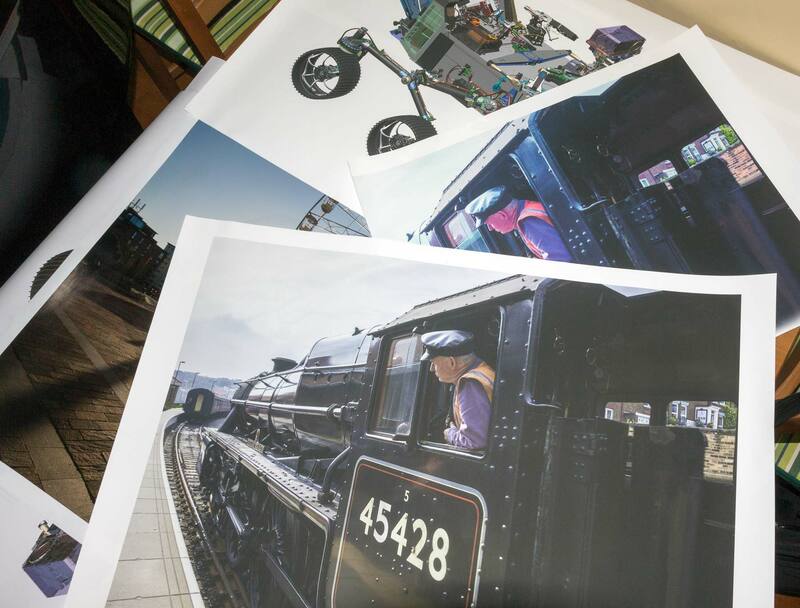 This is somewhat shorter than Keith’s usual in-depth printer reviews, looking mainly at how good the print quality is for making photo/poster prints – surprisingly good it turns out, even with just 4 colour inks (CMYK). It is not an exhaustive test of the CAD/plotting side of its functionality. Anything purchased via our links helps support the running of the site. I’m looking at the Canon TX-3000 printer. 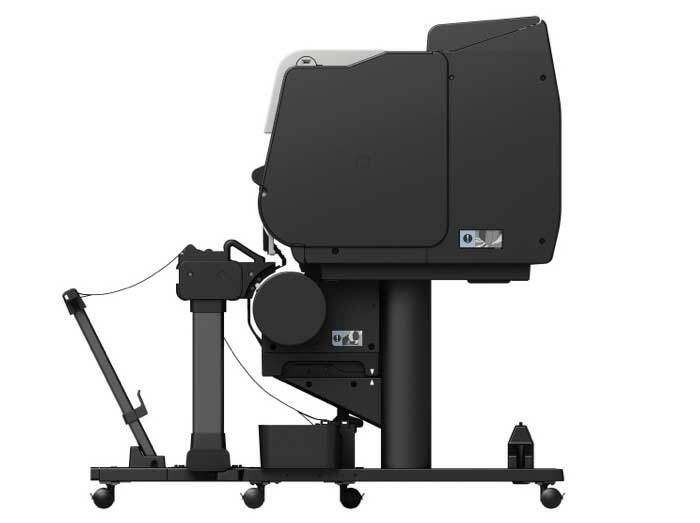 This has a 36″ media width, and from a design point of view is very similar to the PRO-2000/4000 I’ve covered in an extensive PRO-2000/4000 review along with a detailed guide to PRO-2000/4000 setup and moving. 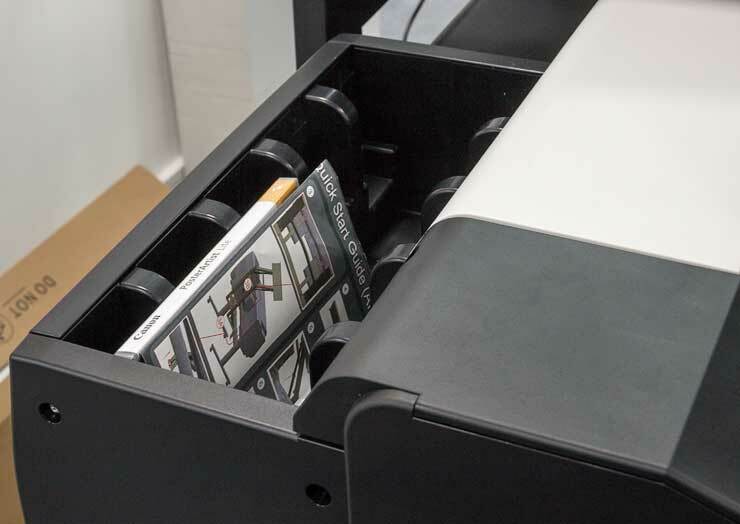 The similarities are so great that if you are interested in a TX-x000 printer, I’d suggest you might also benefit from reading the PRO-x000 articles. Here’s the 36″ TX-3000 next to a 44″ PRO-4000. This is well out of my area of expertise, so I happily left the windows 10 based tablet well alone, unplugged its USB cable and plugged in my Macbook Pro to get on with some printing. From Canon – see full specs at foot of article. SNMPv3 and IPSec support to prevent leaks and intrusions. The ink set is not the same as in the large format PRO printers I’ve looked at, and is much better on plain paper and exposed locations. As I’ll show later, with the right media it’s also pretty waterproof. The printer is set up and initialised the same way as in my PRO-2000 setup although there are just 5 inks to load up. The print head assembly sits off to the right when not printing. 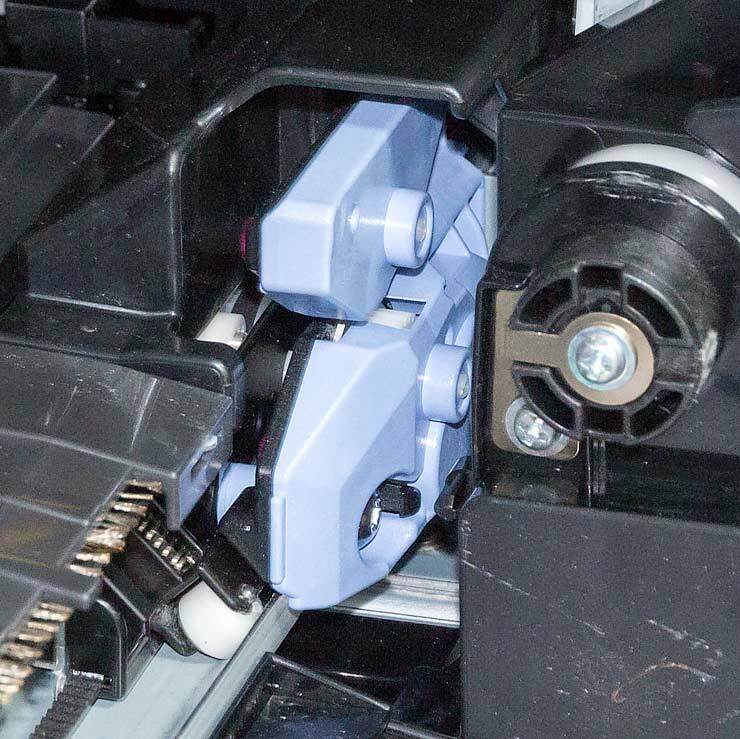 It moves across for printing and print head (PF-06) fitting/replacement. 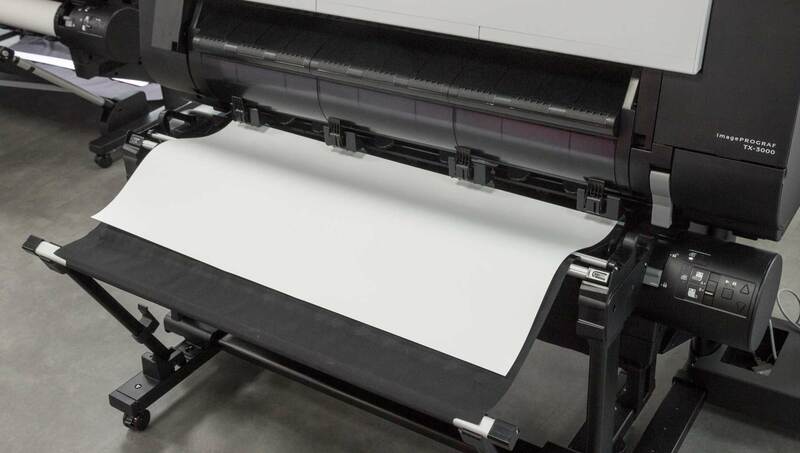 The print head has six print channels (2 for matt black) which give a faster print speed – particularly noticeable when printing black only charts at draft settings. Note the 5 ink lines. The ink cart hopper on the left side of the PRO range is still there on the TX, but used for storage. 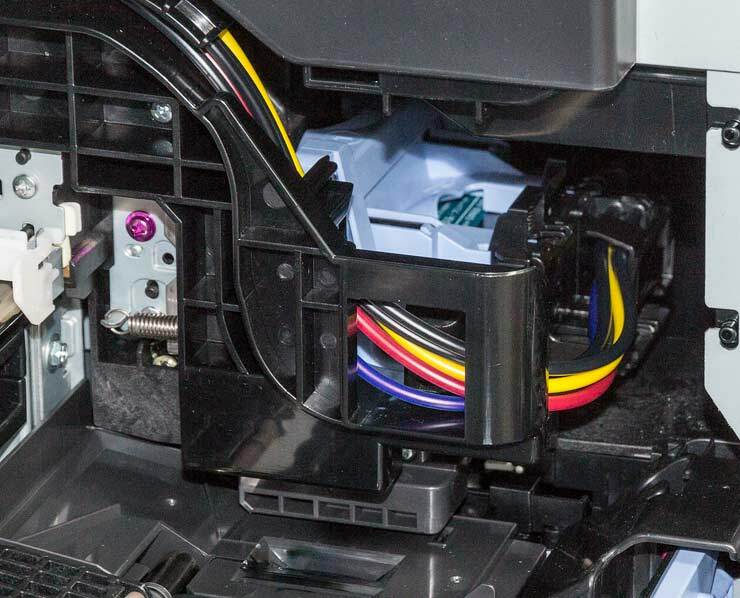 The printer has wired Gigabit Ethernet and USB connectivity at the back. Still not USB-C, so you can notice a bit of sluggishness with some very big image files. There is built-in wireless support too. 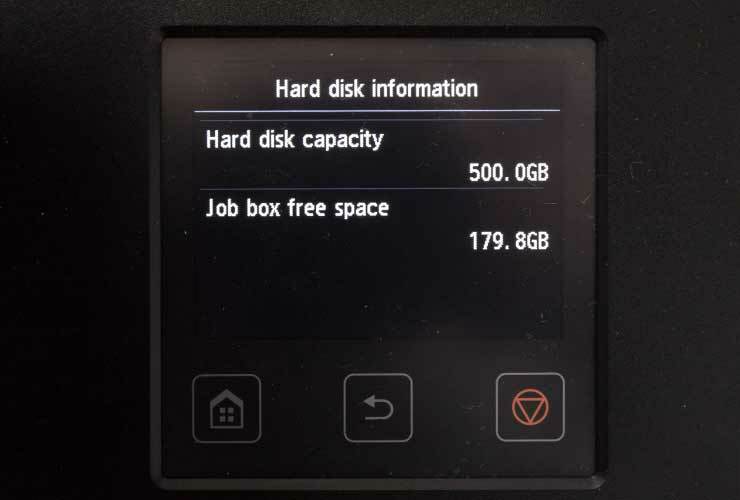 A useful feature is the internal hard disk, allowing for job spooling and storage.It’s encrypted, if you were worried about someone stealing your print jobs. There is some more info about the many security related features in the specifications section, at the foot of the article. 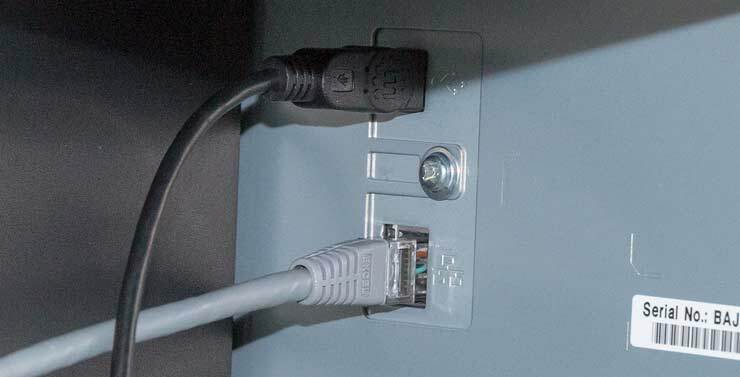 There is also a USB-A socket at the front for direct printing off memory sticks and the like. JPEG and PDF file formats are supported. 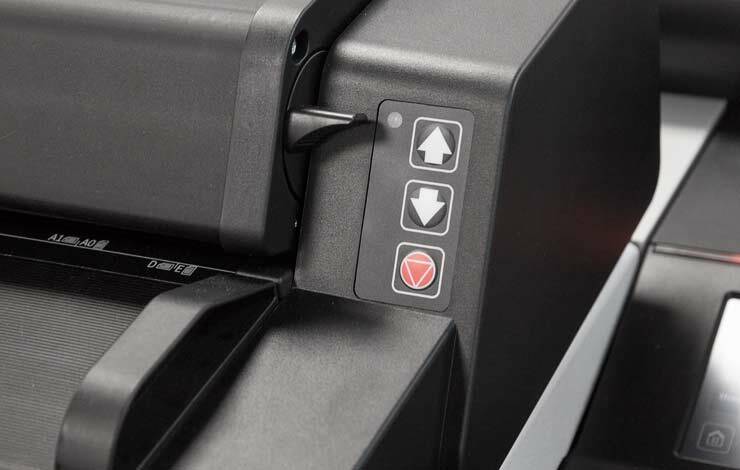 The colour touch screen at the front is clearly laid out for basic printer control and setup. Note how one of the five inks (matt black) is showing low. The main menu scrolls up for more. The scanner fits on its own support frame, so I just lifted it out of the way for my printer testing. It only has a few controls – remember that it’s driven by the tablet at the side (which I’ve unplugged). The lift has a locking clip (red) you need to press to lower. 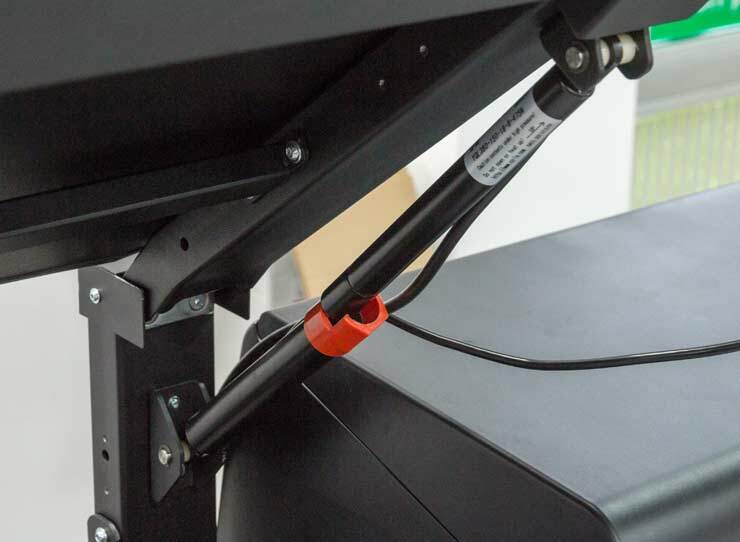 If you do have this option – be sure to get a few extra cable ties to tidy up the cables. 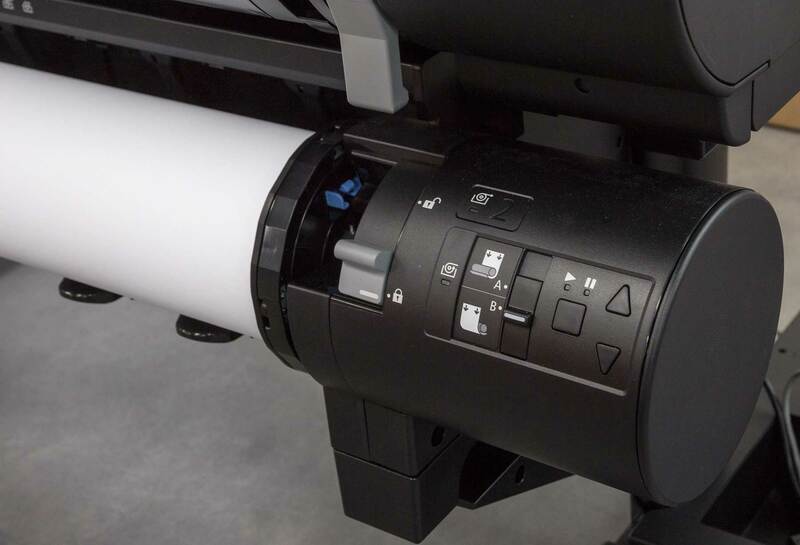 The printer has a curved media path, with paper coming up from the upper or lower roll holders. The lower roll holder is powered and can be used for paper or take-up spooling. The main paper roll holder is accessed by raising the roll cover. The top roll in this case is Canon 200gsm Satin Photo paper and the lower roll is Canon 80gsm Plain paper. The roll loaded at the top is a 36″ one and the bottom is A0 size. Sheet feeding is also available. See the PRO-2000 review for much more about paper handling. There is a built in roller cutter at the front of the printer. It’s a user replaceable part (CT-07), but do take care with what you cut. I used it on a moderately heavy canvas and it cut very well. However, for day to day heavy use with such media, you might want another cutting solution. There is an interesting print catcher option that can hold a lot of cut prints. 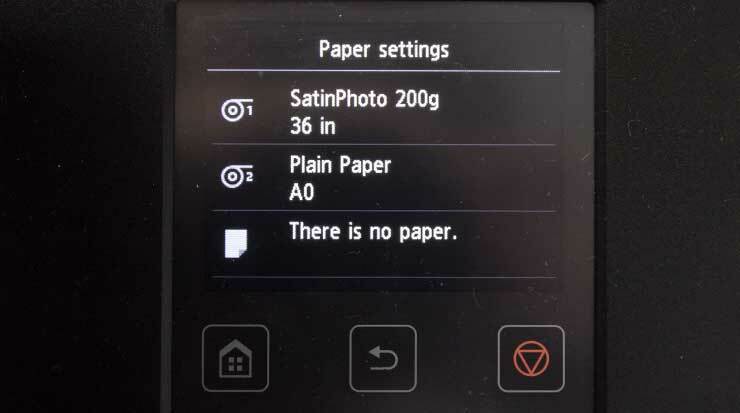 The printer lets you specify what paper is loaded (I’ll come back to this in a bit) and it shows on the front panel what it thinks is there. 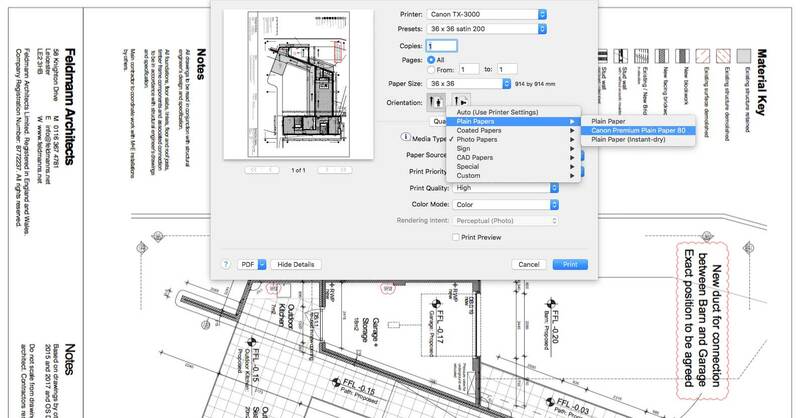 You can set paper parameters and load/unload paper via the panel. You can optionally get ID codes printed on roll paper ends which say how much is left and what it is. This is useful if you’ve lots of people potentially using the printer, on an occasional basis. 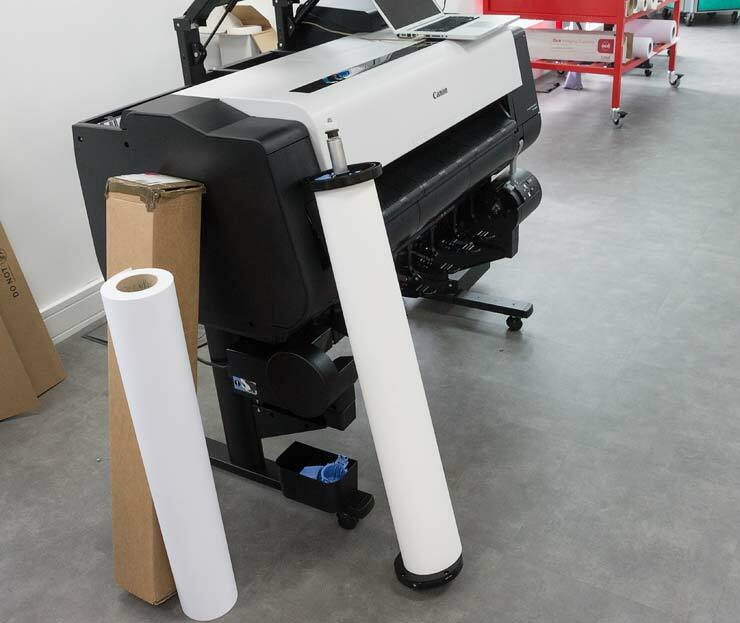 You can also manually feed paper from rolls, and for many thicker media this is the best option. When testing the PRO-2000 I found that some heavy fine art media were too stiff to work with the auto take-up options and needed manually feeding. 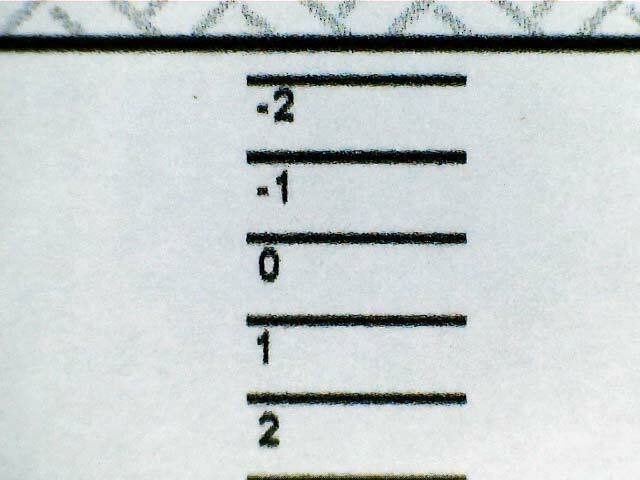 The pressure rollers on the roll unit can also mark more delicate papers if left in place for any length of time. My own preference would be to avoid leaving media loaded in the machine longer than necessary. Remember though that I was testing the PRO-2000 with some pretty expensive papers. 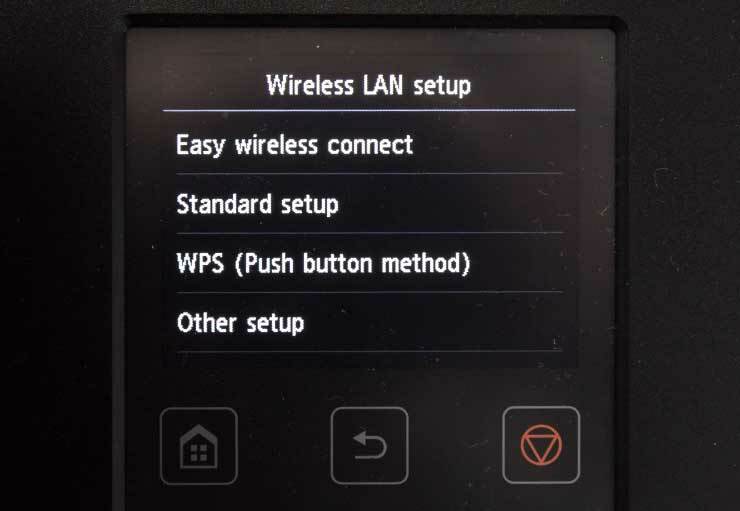 One of the features I particularly liked with the PRO-2000 I had here (and other larger Canon printers) is that media settings can be grouped together and defined as a set for a particular media type. 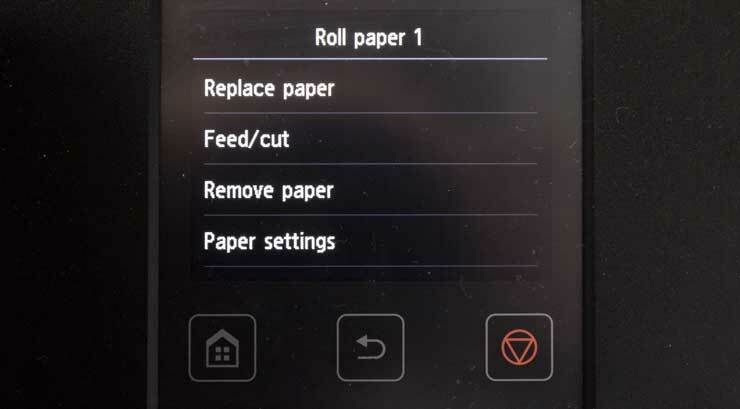 The settings contain information about paper feed and alignment, along with all kinds of settings such as drying time or even the preferred ICC printer profile for the paper. 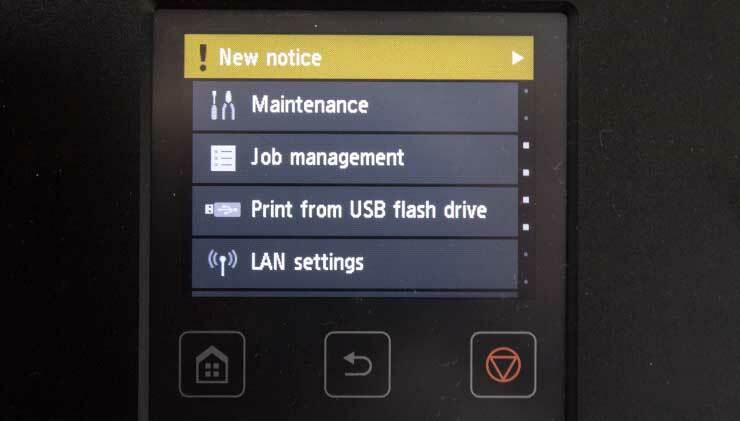 The settings held in the printer are the default ones used. 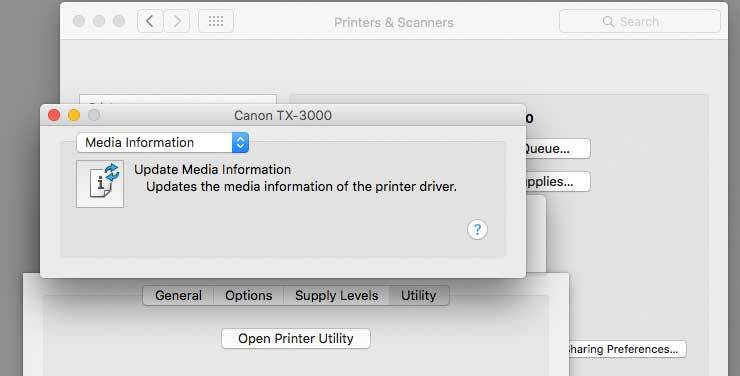 So, when I set up my Macbook Pro with the TX-3000 printer driver, I need to get the current settings from the printer. This will, after a short while, update my driver with all the media settings installed on the printer. What if I want to try a new paper type? Well, you need to create or get the settings, and download them to the printer. Here’s Matt from Canon (my guide for the day – thanks!) 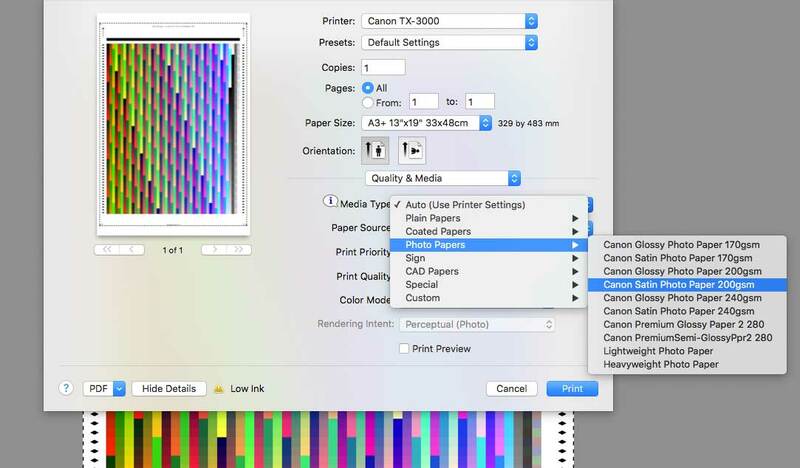 finding the appropriate settings from Canon’s paper info site, and sending them to the printer. This is from a windows PC – the files are the same. You can see my Macbook on the printer. Once the info is on the printer, I’ll need to update what’s on my Mac again to get the new ones. 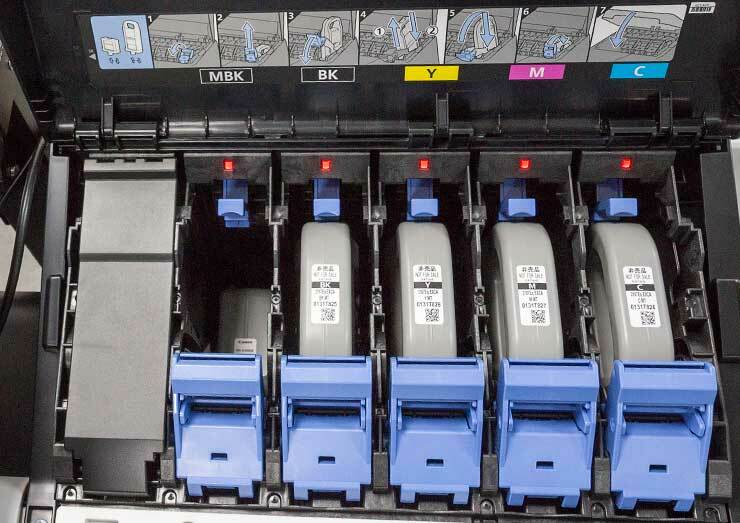 One minor limitation is that the printer can only hold a maximum of 65 media types. You might think that this is not a limit you’d be likely to face, however there are over 60 media types pre-installed, so you may want to remove a few of the more uncommon ones. 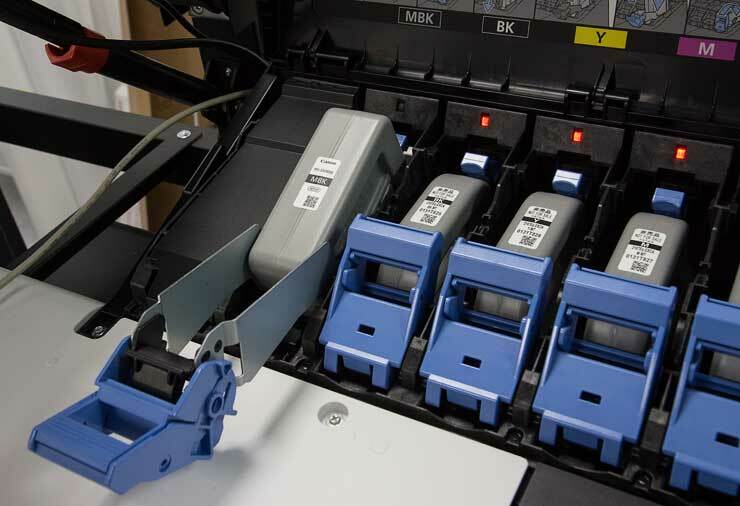 The ink carts for the printer are available in different sizes, and simply drop into the hopper at the back, via a locking lever. 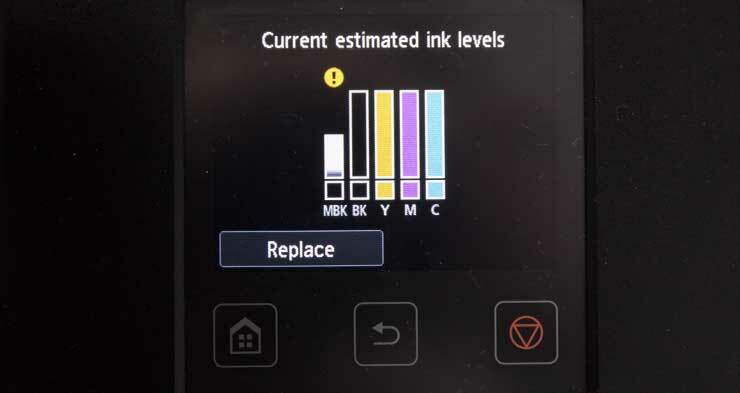 When I started with the printer, one ink was low and quickly needed changing. Looking in the ink cart area, I can see that the MBK cart is one of the smaller ones. Lifting the blue lever, extracts it. I’m replacing the small PFI-110 (160ml) cart with the largest PFI-710 (700ml) type. There is also a 330ml size (PFI-130) available. 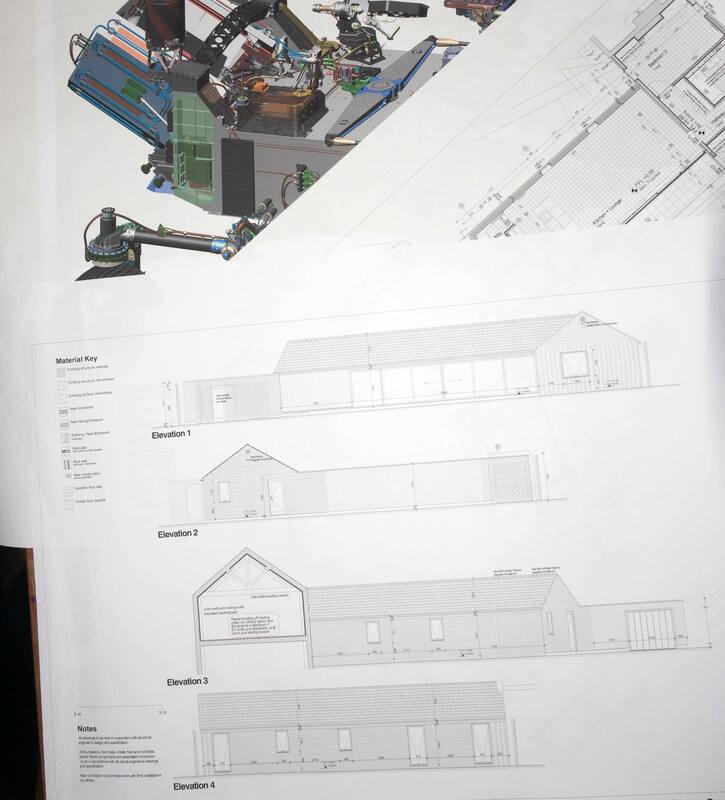 The whole process takes only a few minutes, and from PRO-2000 experience can be done whilst a print is being produced. However, do note that if you wait too long to replace an empty cart mid job, then the printer may abort the job. Empty carts are properly empty. 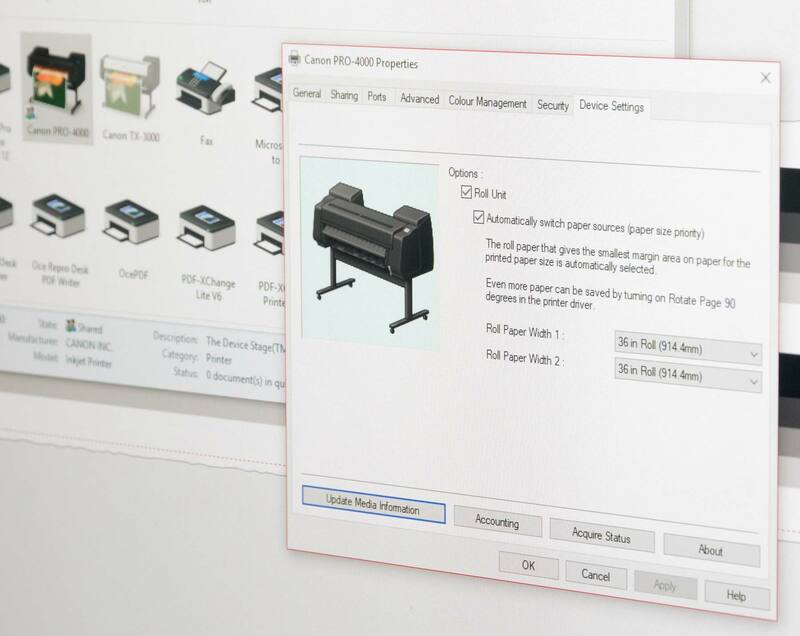 There is Canon software available that lets you record ink and media usage. It’s the same as I’ve covered in some detail in the PRO-2000 and PRO-1000 reviews. Do note though that the accounting software records ink usage for printing, not cleaning. More detail is possible, but you’ll have to work it out for yourself from total ink usage. 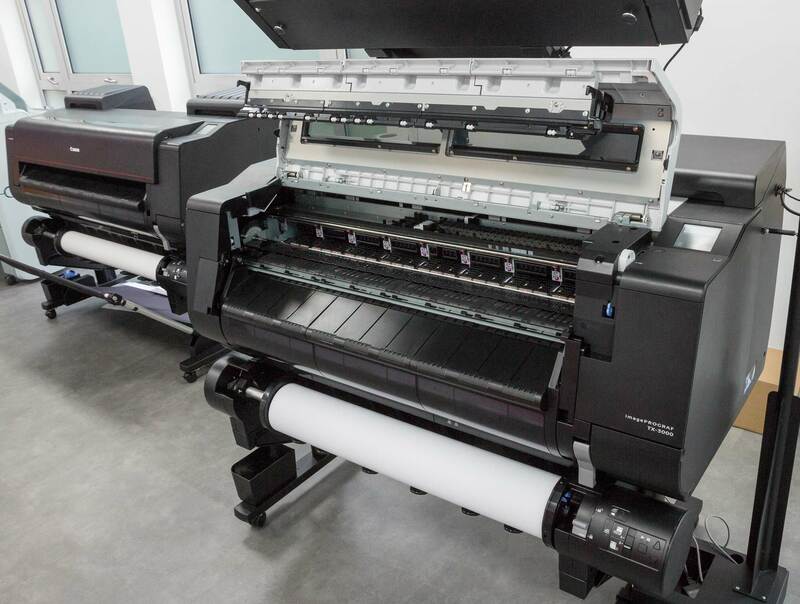 When I was asked if I’d like to look at the TX-3000, my first thought was to wonder just what sort of quality I’d get for photos from a 4 ink CMYK printer? I remember the difference that adding light magenta and light cyan inks made to photo prints many years ago. 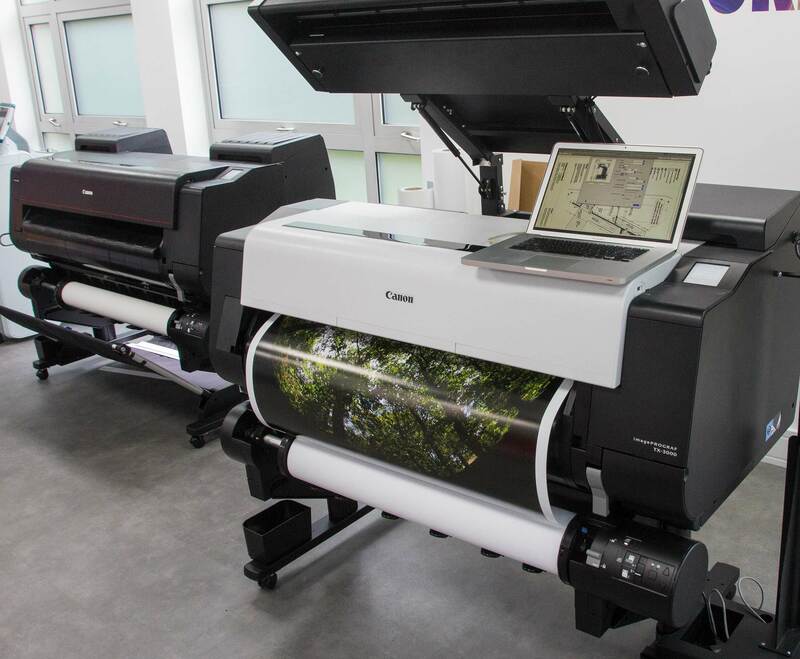 The printer might be great for graphics, CAD and posters, but what about if you wanted to print the occasional large photograph? I picked a fairly basic 200gsm satin photo paper to try. It’s a bright white and if handled carefully not too prone to creases. First up I need to print a profiling test target. I’m using Apple’s ColorSync Utility, since it has a print mode specific for target printing, by making sure all colour management is turned off. Here’s the target being printed. It’s ~3000 patches and fits on an A3+ (13″ x 19″) sheet. After leaving it to dry for 40-50 mins, it was time to measure the chart with my X-rite i1iSis spectrophotometer. 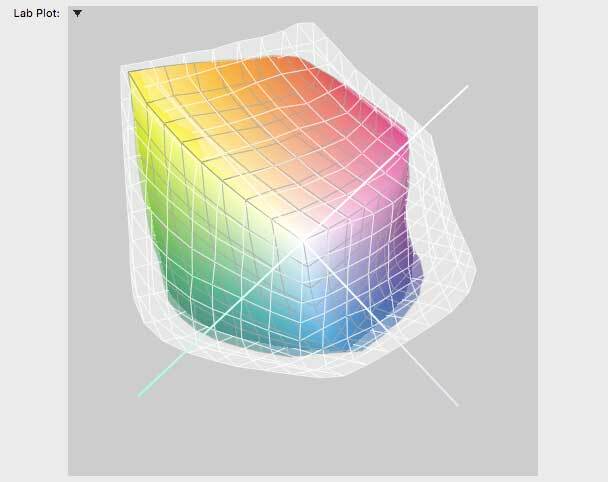 I’m making my ICC profile with X-rite i1Profiler software. The transparent outline represents the gamut of the PRO-2000, whilst the smaller solid shape shows it for the TX-3000. 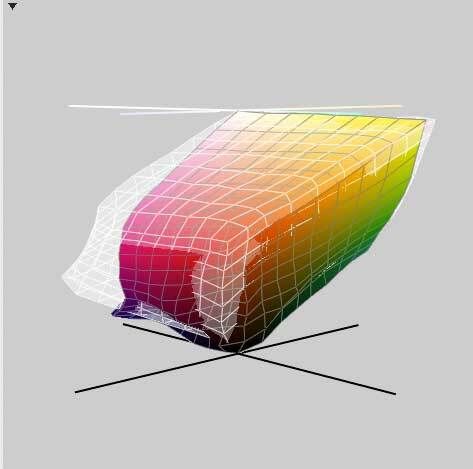 From ‘above’ the expanded gamut of all those inks in the PRO-2000 is quite clear. Looking at a side view, shows the differences are not that huge. In some dark areas, the 4 colour printer is besting the photo printer. Let’s get back to real world images though. One reason that I generally eschew these graphical displays is that they invite an overly simplistic better/worse comparison. This is the gamut plot for semi-gloss/lustre media, using the photo black ink. On matt media you get a smaller gamut anyway, and the differences would be even less. I used my new profile for test prints on the satin paper, but for others used the Canon supplied profiles. When you update your printer driver with new media settings, these may include ICC profiles for the media. I noticed that all the profiles for the new papers added via the PC earlier, were now there on my Mac. One slight problem is with Canon’s profile naming – the profiles are identified by the paper ID code, rather than any meaningful names. You can get this code from the end of the box that the paper came in, but it’s a pain. 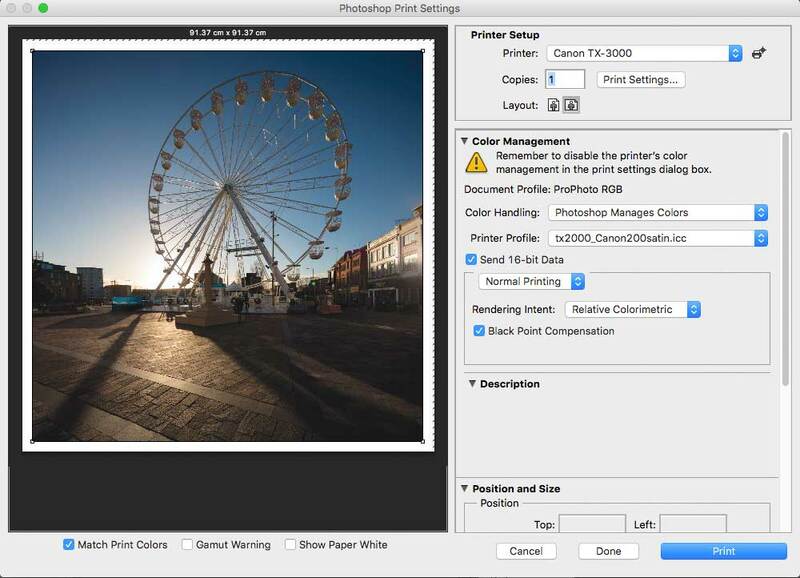 You can print in ways that will automatically use the profile from the media configuration file, however for printing images from Photoshop or Lightroom, I’d strongly suggest letting the application manage the colour and making sure that colour management is not being done for you by the driver. 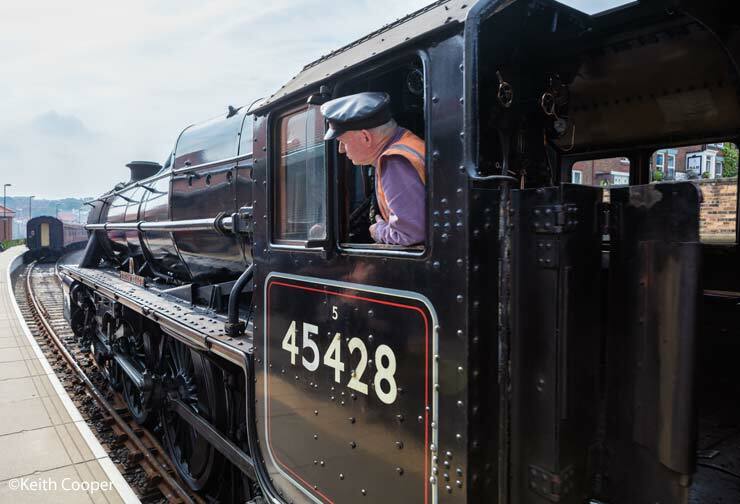 Here’s a couple of prints (of a steam train at Whitby) showing what happens if the driver tries to do colour management for you, when it’s not needed (aka double profiling). 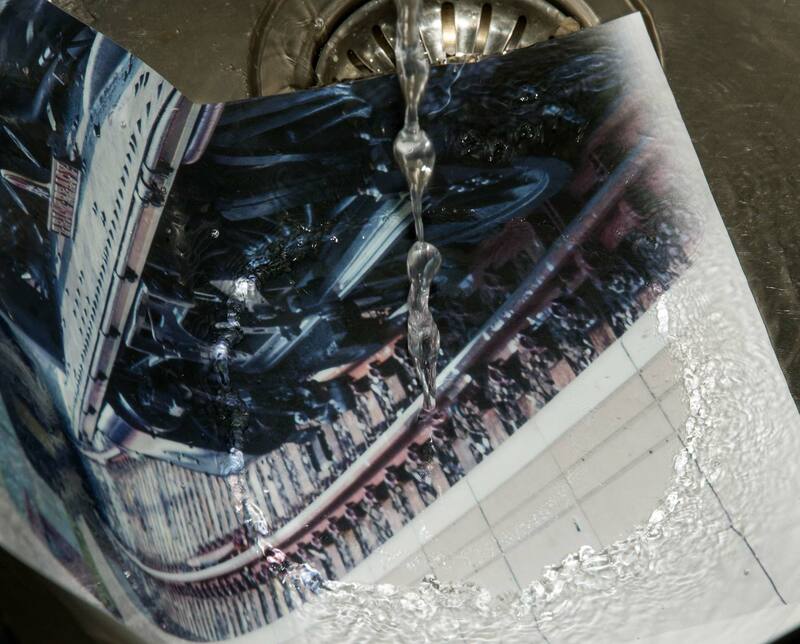 The media is a self adhesive waterproof matt polypropylene paper. Note how the muted colours of the first print are much better. The original image of the steam engine at Whitby station shows how the matt media flattens the look of photos if you are not careful. It also shows why choosing the right paper for an image is important. My original print of the photo above was printed on a cotton rag paper (and framed as a present for my Father) with specific tweaks to the saturation/tone of parts of the image to match the paper used. Print is the ‘wrong colour’ one. Two large photos I printed on the satin paper both have areas that stretch some print setups. The blue sky of the big wheel photo very easily shows banding and posterisation in the sky. I’m printing directly from Photoshop using my freshly made profile. 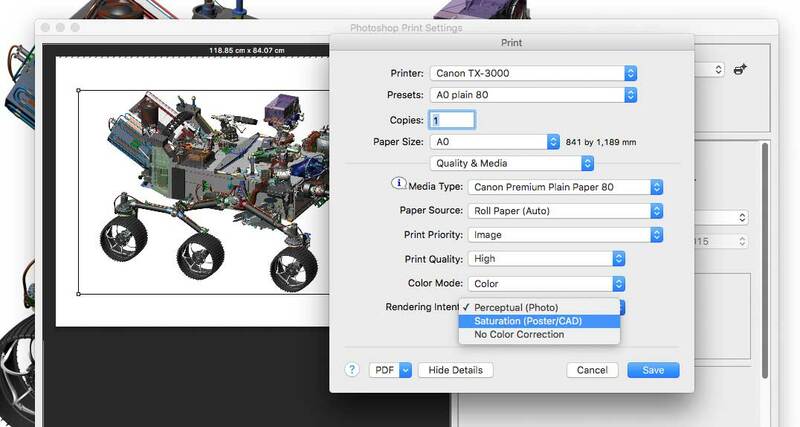 You’re seeing a screenshot of Photoshop’s version of a soft proof. 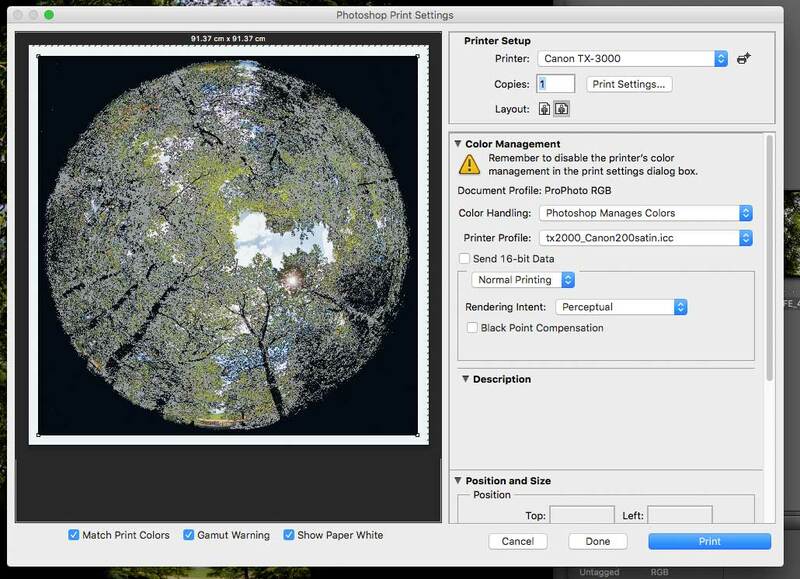 Turning on the ‘Gamut warning’ indicator, shows only a few light grey areas out of gamut. The B&W prints are one of my standard test images. One print uses the printer driver’s B&W print mode, and the other uses my custom profile. An outdoor woodland scene has a lot more dark foliage colours that challenges a 4 colour printer. Once again, the Gamut Warning shows up potential problems in light grey. This is one of those things that can catch out the unwary. The gamut warning feature is a useful, but fairly blunt tool. Everything out of gamut is shown, no matter how slightly. It’s one of the reasons I try and encourage people to really look at prints, rather than rely too much on soft proofing. An actual print however shows none of these horrors. Sure, if I put it next to one from the nearby PRO-4000 and carefully compared the two, I’d see some deep shadow detail and dark colours that just weren’t there on the TX-4000 print. 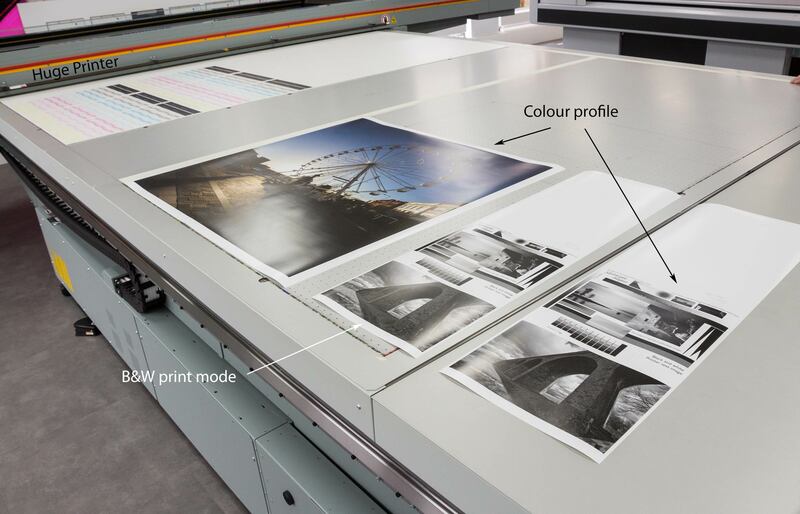 Back in the real world, people just see an interesting 36″ square print, and if they live near Leicester, many will recognise where it was taken from. As expected, printing was quite rapid and the lines were very sharp. Not bad for what was a plain paper with no special coatings. If you enlarge the image above, you can also see how the ink looks on the satin photo paper – there is some visibility of the ink on the paper surface in the reflected light, but nothing I’d call bronzing (a serious issue with some media I’ve seen used in HP printers). 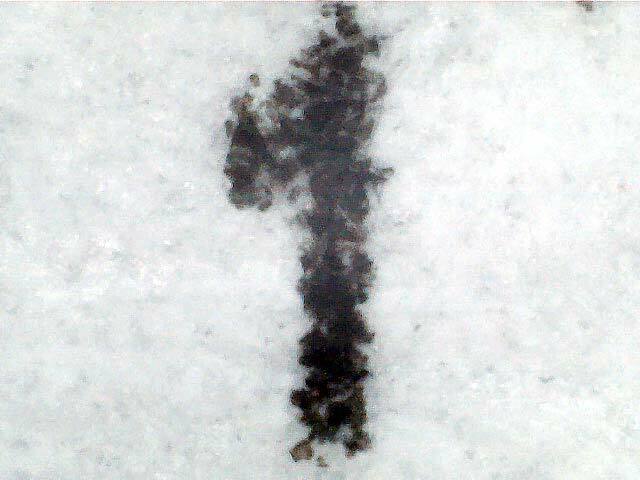 A higher magnification clearly shows the ink dots and lack of bleed. This was at ‘high’ print quality. A CAD image of the NASA 2020 Mars lander has some good strong colours and let me try some different print modes. 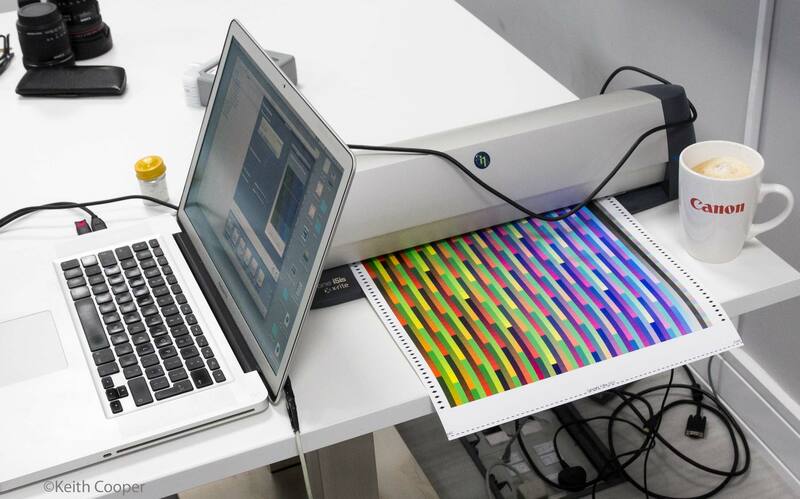 This is printing using ‘Printer manages colour’ in Photoshop. 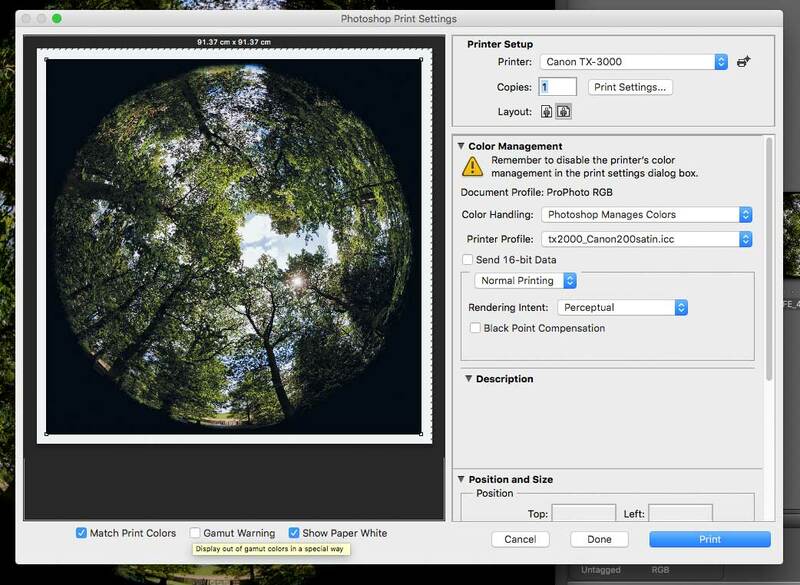 There is a range of workflow related software available from Canon, but that’s outside the scope of this particular review. 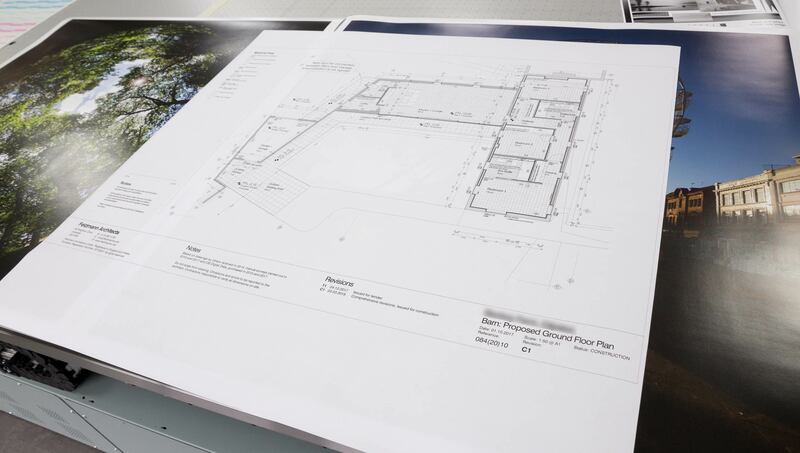 Canon also supply some basic layout software that can be of use for placing multiple images on a sheet. I’d use Imagenest for my photo layout or possibly Mirage (both tested on the PRO-2000). Whilst I didn’t try it, there are borderless print options available, as with the PRO-2000 I tested a while ago. 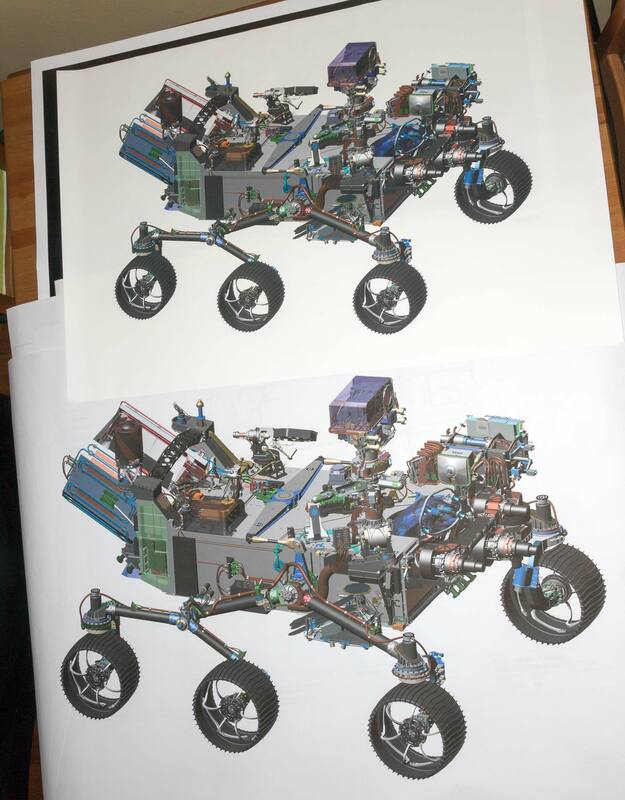 Here’s the lander image printed on plain paper and the waterproof self adhesive one I mentioned earlier. 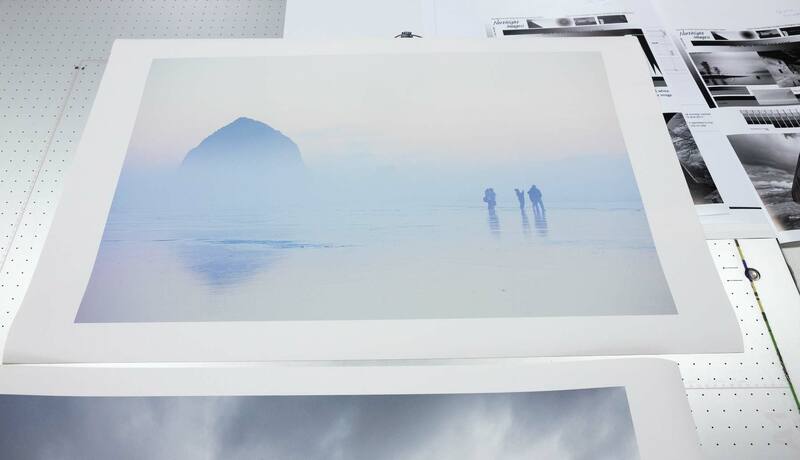 I popped a roll of matt cotton canvas into the printer and tried two images that I know work quite well on matt media. The first is the dusk light at Cannon Beach in Oregon. This would look good with a coat of varnish, although as a ‘natural’ cotton canvas it has rather too many dark specks in it, for my taste. 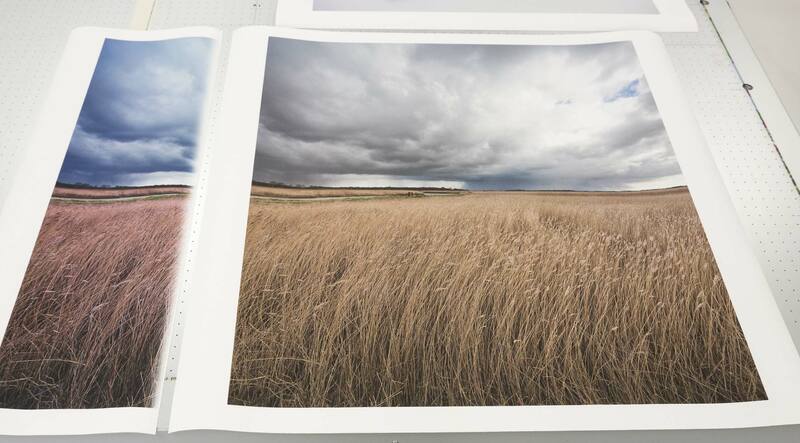 The second print of a very cold winters day at Snape reed beds in Suffolk works well with the more muted tones available on a matt surface like this. Note too the ‘double profiled’ reject partial print at the left, reminding me to take care with printing dialogs when media settings have profiles embedded in them. I’ve looked at fairly specific aspects of using the TX-3000 and answered my main question about using it to make the odd photo or poster print. The photo quality of the four inks was never going to match the PRO series, but I was pleased at how good the large prints looked, especially on better quality media. I’ve only shown a selection of the ones I made, and many passed the ‘Would I want my name next to it, if it was on someone’s office wall’ test. Colour profile handling was a slight issue, from the cryptic Canon profile names to a couple of instances of double profiling. 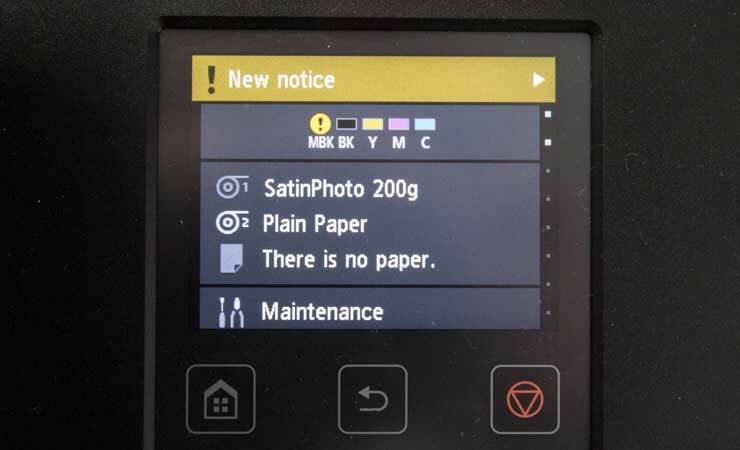 Not a big concern, since I was using a new printer from scratch, with only the day to test it. I realised that when I’ve tested all of Canon’s other printers I never embedded profiles in the media files. I’m sure it works well with many applications, but take care. If you’re looking for large black and white photo prints then be careful to see how they look under different lighting. With just the one black (Mk or Pk) many would say that you shouldn’t expect to get any quality from B&W prints. Well, from printing my test images I can confirm that both the B&W print mode of the driver and printing B&W images via a custom profile produce broadly acceptable prints. However you should be aware that the two techniques can both leave a slight residual colour tint, that depends on the media used and the lighting. If you are really serious about B&W, then you’d get one of the PRO printers – I’ve lots more about B&W printing in the reviews. 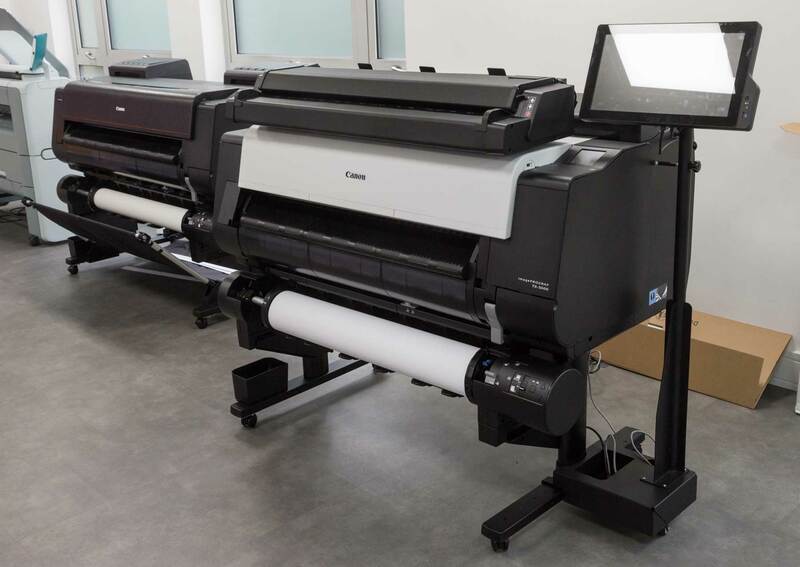 The TX-3000 works rather well, and with sufficient care in image editing, there is no reason that a architect’s practice or design company couldn’t produce very nice looking large prints of photos or renderings, as well as all the line drawings, posters and charts they might need. Quality on plain paper is good, and with the water resistance of the inks, your drawings are not going to run when it rains on a site visit. 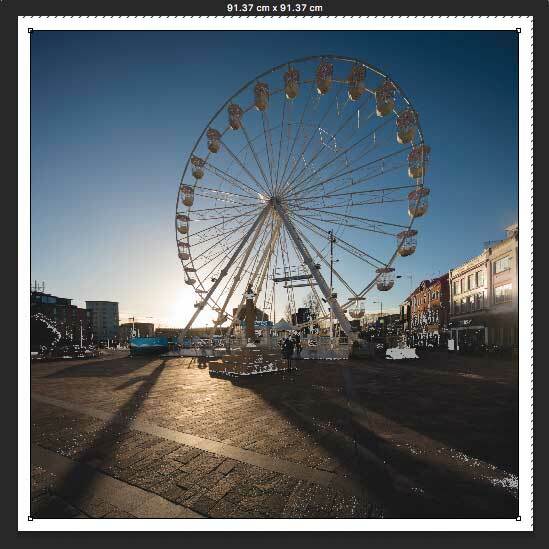 The range of media available make short term outdoor prints a viable option, with backlit media and other display options for graphic and display use. 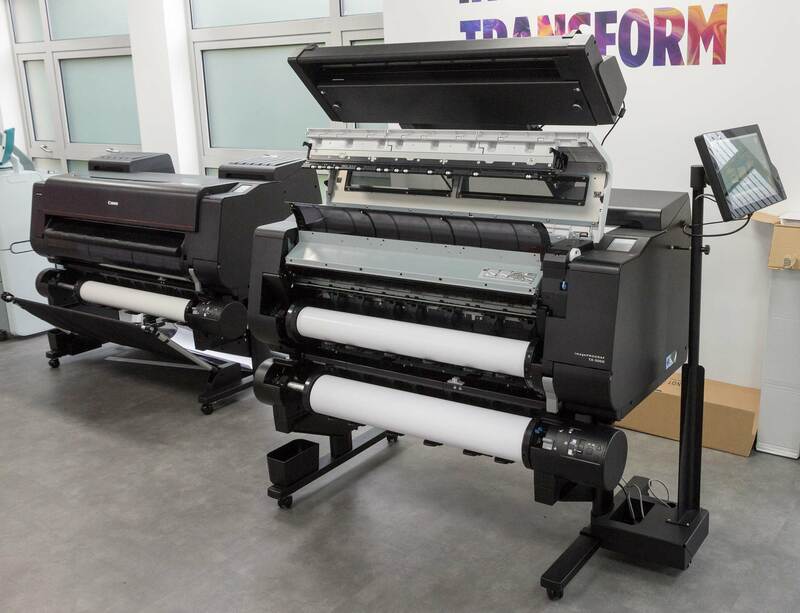 The TX-3000 is a good all round printer – I’d personally pick the PRO-2000 or 4000 for my work, but then again I run an architectural and commercial photography business, not an architectural practice or design house. Thanks to Canon UK’s printer showroom in Birmingham for the help in facilitating this short review. Questions/comments? Please feel free to ask directly, or use the comment form at the foot of the article. 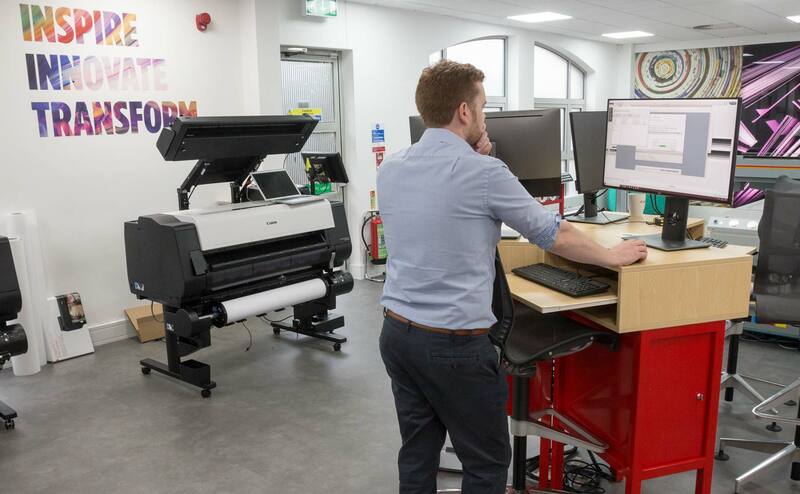 Software Included imagePROGRAF TX-Series Printer Driver, Quick Utility Toolbox, Print Plug-in for Office, Extended Survey Program and Poster Artist Lite other software is available to download from Canon’s web site. 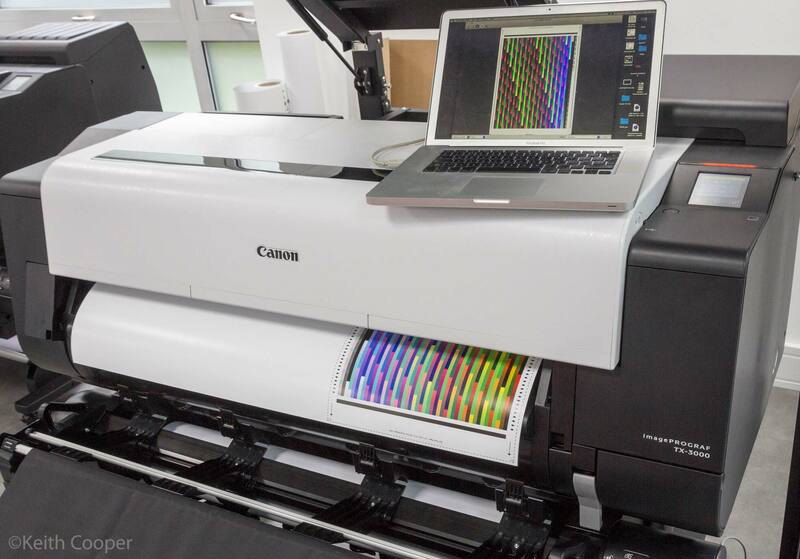 Self-encrypting and decrypting of image data while printing.